Utilising the diver solution’s web portal to view and interact with intuitive, visually impactful dashboards, users can obtain at-a-glance information on key performance indicators and other critical metrics impacting on their business. 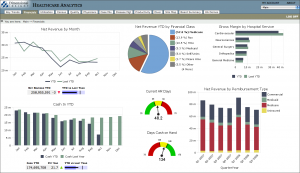 Dashboards are simple to develop and provide users with secure, meaningful role-based and timely intelligence Web-based architecture allows you to quickly deploy dashboards to collaborate with key customers, partners, suppliers or other stakeholders by bringing disparate data sources together into a single view. Users can interact with data by viewing top-level Key Performance Indicators relevant to their functional area or access underlying detail data in any of the dashboard’s charts, gauges, or report views.